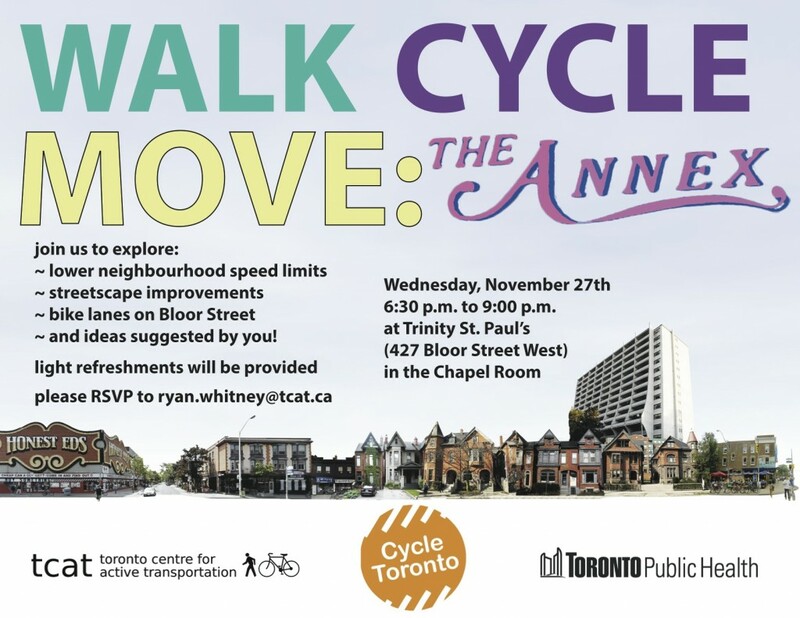 Walk Cycle Move: Annex workshop November 27 at 6:30 p.m.
Want to join the conversation about the future of cycling in Toronto? Walk Cycle Move wants to hear what you have to say. Check out this upcoming workshop in the Annex on November 27, hosted by the Toronto Center for Active Transportation, in partnership with Toronto Public Health and Cycle Toronto. The workshop will be on Wednesday, November 27 from 6:30 to 9:00 p.m. at Trinity St. Paul's, 427 Bloor Street West, in the Chapel Room. It will look at public opinion on some proposed projects that could improve walking and cycling safety in and around the Annex, including changing speed limits, bike and pedestrian-friendly improvements to the streetscape, and the revival of the Bike Lanes on Bloor project. How to get involved? Check out the details here, or email ryan.whitney@tcat.ca to RSVP, and if you can’t make it to the workshop, you can still take a minute to complete this survey. Thanks to the organizers for facilitating this important conversation! More information here on the TCAT website.